Rock Island High School students (Freshman, Sophomore, Junior, Senior) and their parents along with Edison Jr. High and Washington Jr. High 8th grade students and their parents are invited to the Rock Island High School 2019-2020 Courses & Activities Showcase on Tuesday, December 4. 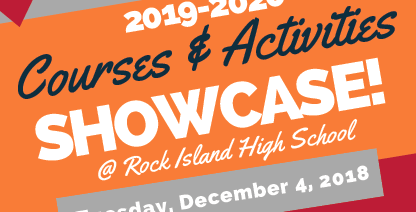 Students and their families can learn about the many courses that Rock Island High School has to offer - Advanced Placement (AP), Dual Credit and specific career-track programs. There will also be colleges and universities at the event! Dinner will be served in the cafeteria from 5 - 6 p.m. and then the Showcase sessions will be held from 6 - 8 p.m.